I love a good homemade coleslaw, especially a creamy one or one loaded with a lot of fresh veggies. Many people think that making a homemade coleslaw at home is time consuming and difficult. Well, I'm here to tell you that it's not! During the late Spring through early Fall months, I will make it about once every two weeks. I vary the recipes so that we don't get tired of it. No summer family picnic is complete without it! Today's recipe is courtesy of Paulding & Company. You can visit their website to learn more about them. The recipe will yield approximately 3 cups, for about 6 servings at 1/2 cup each. I would definitely substitute the regular mayo with reduced-fat mayonnaise to help cut down the fat calories, making this even healthier! Combine vinegar, granulated sugar, Dijon, salt and ground black pepper. Stir in mayonnaise. 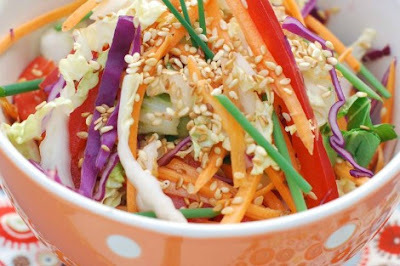 Add cabbage and carrots, allow to marinate together 1 hour or longer in the refrigerator. May be kept for a week without loss of quality. My husband loves coleslaw - mainly because he loves cabbage. At times I vary it by adding peppers and onions or even broccoli florets and zucchini.